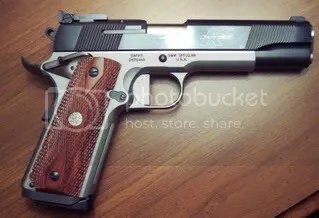 When the S&W 1911’s first came out I honestly was not impressed. The trigger was gritty and the pull was heavy. As well the gun had very sharp corners. Now, some four years later I looked at the S&W 1911 in the Gunsite version as well as the Doug Koenig version. I must say I was very surprised at the change in quality as well as the trigger feel and pull. I also appreciated the enhancements made since the first guns. It’s my understanding that many of the internal parts as well as some of the external parts are supplied by Wilson Combat. It doesn’t get any better than that! 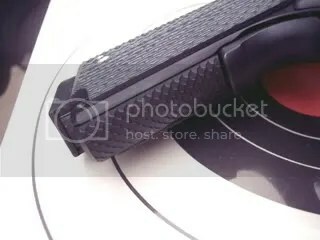 Some shooters may think the flat trigger to look somewhat strange but it actually feels very good and gives a positive feel and break. I won’t be changing it for a traditional match trigger. 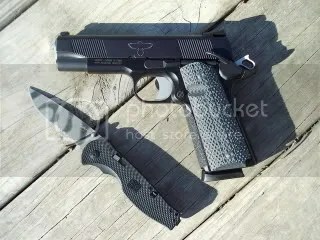 The pistol also comes with an extended magazine well, Koenig speed hammer, ambi-safety,Rosewood grips with S&W logo, titanium firing pin, full length guide rod (questionable use)Koenig match trigger and a match grade barrel. I purchased the Doug Koneig version and immediately went to my small range. I found this S&W very accurate and the trigger was great. I don’t have a trigger pull guage but I would estimate the trigger at about 4 to 4 1/2 pounds. After adjusting the sights (this is the first 1911 I’ve owned with adjustable sights) for the load I normally use I shot a full magazine of nine rounds at 10 yards. The rounds made one hole about 2 inches across and the same vertically. I put a total of 125 rounds through it and had no malfunctions whatsoever. With the two tone finish, the frame being stainless and the slide carbon steel, it looks like a million bucks. I also like the fact that S&W has reduced the size of the nomenclature on the slide flats. I hated the original huge graphics on the first guns. While the “K” graphic is large it is tastefully done and not super thick like the old S&W 1911’s. 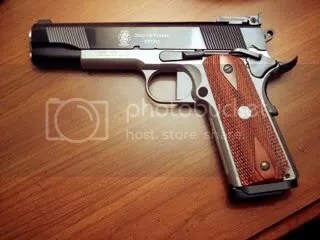 The opposite side has a small S&W logo with SW1911 in laser engraved small letters. A very classy gun! This gun is a keeper and will serve well on the range, in competition or for defensive carry.